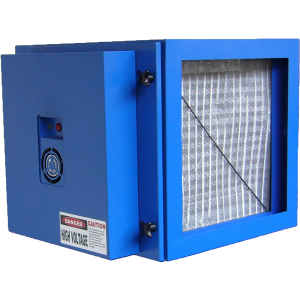 The Airclean Electrostatic Precipitator (ESP) can be used in kitchen extract systems or industrial applications for the efficient removal of grease, smoke, and airbourne oil / coolant mist. 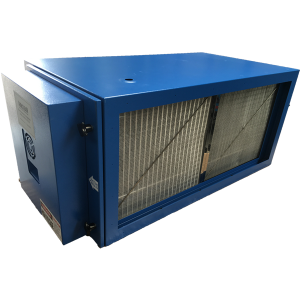 ESP’s can be either duct mounted or free hanging for the recirculation of air. 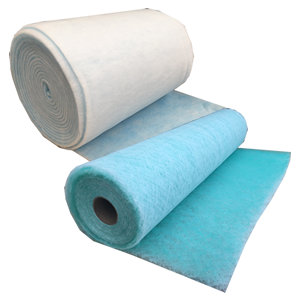 A single pass ESP will achieve a grease and smoke removal efficiency of 95%. Where efficiency is critical (eg. Low level kitchen extract) a double pass ESP is recommended to achieve a 99% efficiency. 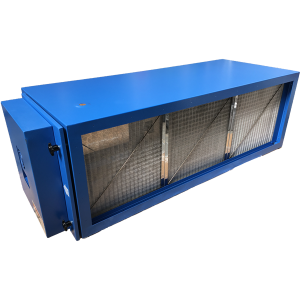 The Airclean Electrostatic Precipitator is manufactured from 1.5mm Galvanised Steel and finished with an Epoxy Powder Coat. 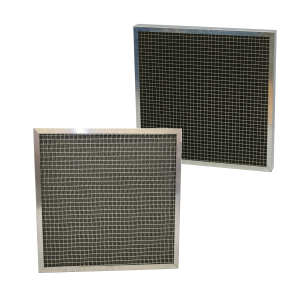 The two Metal Washable Filters within the ESP are manufactured with an aluminium frame and an aluminium knitted mesh filter pad. The Ioniser and Collector in the unit are combined in a single aluminium cell, which can be removed to be cleaned and replaced as required by the operator. Controls: Auto Cut Off Switch When Door is Open. Fault Indicator and Operation Lights. For high grease / oil applications drainage is required. A minimum of 150mm below the unit should be allowed for a suitable drainage system to be installed. To treat airflows larger than those stated multiple units are used together in parallel. An ESP joining kit is required to connect drains and flanges for ducting. Units are to be mounted horizontally only, with access one side only. ESP’s can be handed with airflow left to right, or right to left for maintenance purposes.